Gorla Maggiore is a municipality of ca. 5000 inhabitants in the Lombardy Region, northern Italy. The mean household annual income is around 29,120 €; and the population economically active is 54%. 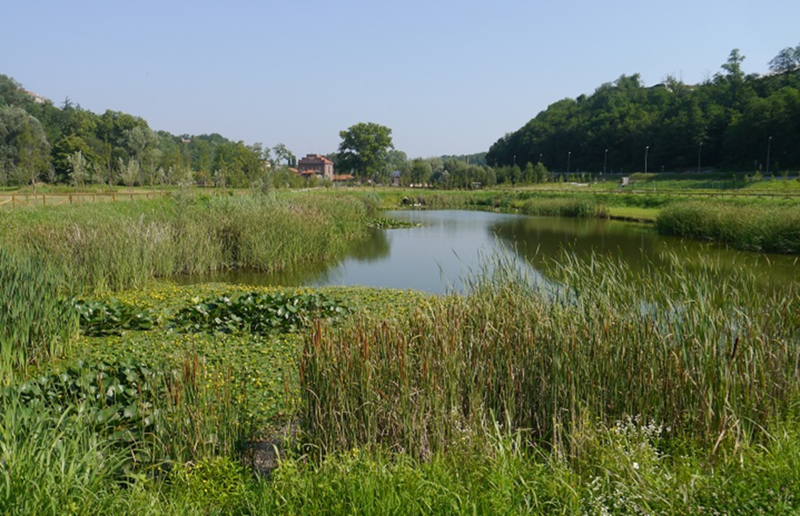 The green infrastructure consists of a set of constructed wetlands (CW), surrounded by a park on the shore of the Olona River in an area previously used for poplar plantation. It includes a) a pollutant removal area with a grid, a sedimentation tank and 4 vertical sub-surface flow CW; b) a surface flow CW with multiple roles, such as pollution retention, buffer for flood events, maintenance of biodiversity and recreation; and c) a recreational park with restored riparian trees, green open space, information panels, walking and cycling paths and other services. The whole surface area is 6.5 ha. Testing the feasibility of a green infrastructure, instead of a traditional grey infrastructure, to treat sewage overflows, and investigating the multiple benefits that the green infrastructure provides and its relevance for water management. Improved management of water resources for the benefit of people and biodiversity. Providing evidence that green infrastructures, besides complying with the existing water regulations, provide additional services. Providing the regional government, the main sponsor of the infrastructure, with a cost-benefit analysis that can be replicated to analyse the potential impact of this kind of intervention in other locations. Showing the perspective of different groups of stakeholders (local residents, municipality, water & environmental managers, experts and NGOs). The findings can be particularly useful for similar situations: municipalities aiming to treat their Combined Sewer Overflow as required, for instance, by the EU Water Framework Directive.Our methods and results could offer practical tools to use the concept of ecosystem services to select the best option between a multi-purpose green infrastructure and a grey alternative, to apply a cost-benefit analysis, and to communicate with the stakeholders and local community. This will increase the awareness about the benefits provided by new or restored ecosystems. Going Green? Economic Valuation of a Multipurpose Water Infrastructure in Northern Italy. Role of constructed wetlands used to treat combined sewer overflow in urban runoff management. Integrated valuation of a nature-based solution for water pollution control. Highlighting hidden benefits. Ecosystem services for water policy: Insights across Europe. Environmental Science & Policy.